2.4GHz Frequency Hopping Spread Spectrum (FHSS) digital transmission. Dual power transmitter utilizes either AC power or batteries (4 AA batteries - not included). 32-channel scan-tuning between transmitter and receiver. 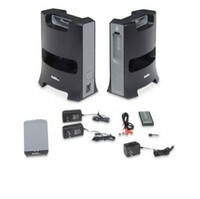 5" 2-way 20-watt weather resistant speaker powered by 6-D batteries (not included) or by AC adapter. Mood light effect. Speaker and remote are water and UV resistant. Supports stereo audio up to 6 speakers (additional speakers purchased separately). Operating distance up to approximately 150' in open areas (less through walls and other obstructions). Auto volume level control. Includes 2 speakers, RF transmitter, remote control, AC adapter for transmitter, AC adapter for speaker and RCA to RCA cable. Purchased these to enable background music whilst outside gardening or having a BBQ. They give a solid, coherent sound which is easy to listen to, and the volume is loud enough to cover other background noises and is of a reasonably good quality at low to mid / high volume. They seem sturdily built, and have a reasonable weight to them. I use them with an iPod touch with music stored as AIFF files.